Let’s go on a vacation this week shall we? How about the beach? I have a couple of beachy themed cards to show off this week because I am READY for a virtual great escape! Today it’s with Power Poppy’s set Under Glass. This image is so sweet and makes me think of treasures from the sea. Any time we’ve gone to the beach the kids have loved to look for shells or scurry away from tiny crabs and admire multi-coloured fish and starfish. This makes me think of all those sweet times of rest. 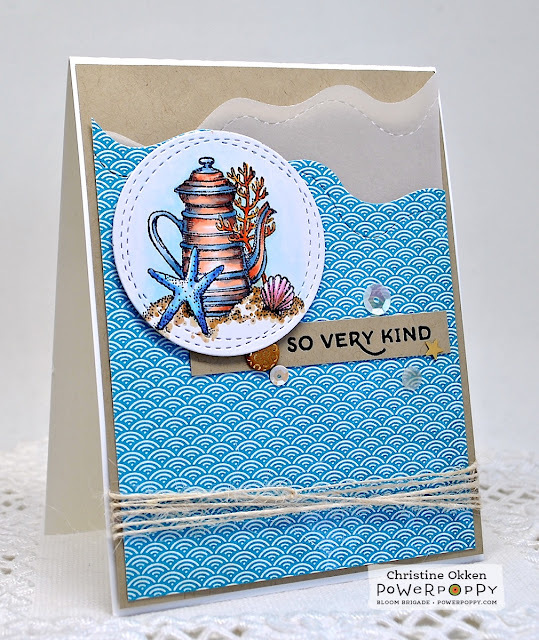 I created the feeling of beach and waves in the background with the kraft cardstock, and vellum die cut waves (TCP Beaches Cutups Die). To echo the treasures from the sea theme I’ve added some sparkly sequins and stars to make them look like they are washing up on shore too. The sentiment is from Power Poppy’s set Bloomin’ Wonderful. Join me for another beachy mini-vacation tomorrow! This design captures the sea life and makes me think of warm and sunny days! 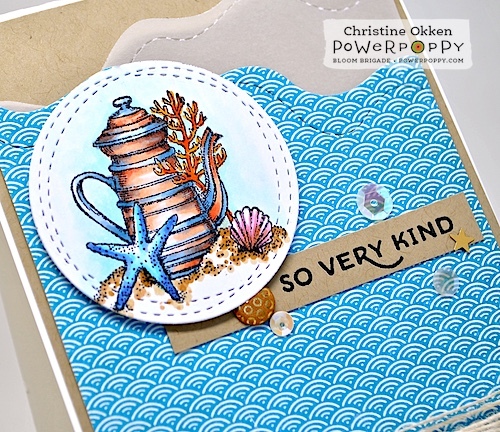 Clever design for this stamp, Christine! 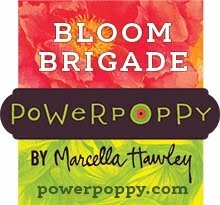 I've been thinking along those beachy lines, too, and have a couple of Power Poppy sets in mind, including this one. The paper you used is perfect, and the vellum for the top of the wave is kinda genius!